(6) You would sign right now for one of three defensive backs – Bush, Hall, Houston-Carson – to be a productive member of the defense. (7) I wonder what odds Vegas will give me on Harvard tight end Ben Braunecker making the 2016 roster. Tight ends don’t exist in the college game anymore (because the college game is silly) but Braunecker fits the John Fox bill. Tough. Smart. Loves to run block. (8) Another UFA you should read about is Villanova linebacker Don Cherry. (The story linked here does a nice job.) You’ll be rooting for this kid come Bourbonnais. (10) No QB, no problem. 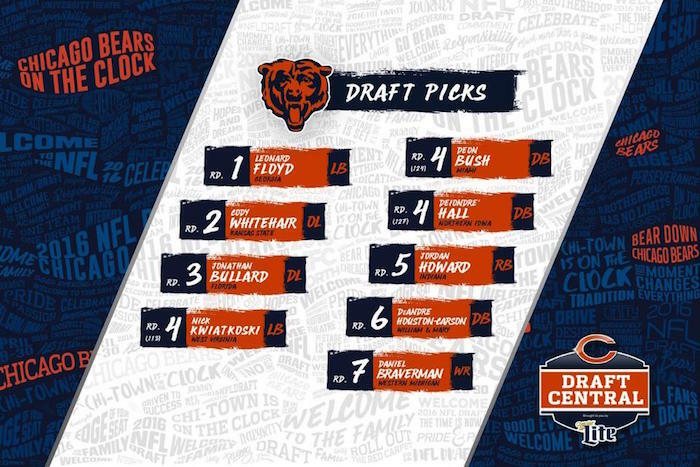 While I wish the Bears would have taken Branden Doughty before the draft’s end, I can’t fault them for not pulling the trigger. Signing Brian Hoyer to a one-year, $2M deal means that the two games Jay misses this season won’t be automatic losses. Hoyer isn’t any good but his teammates like him and he won’t implode.